If, like me, you like to read about how films are made, you’ll know that movie disasters (as opposed to disaster movies) can sometimes be more interesting than success stories. 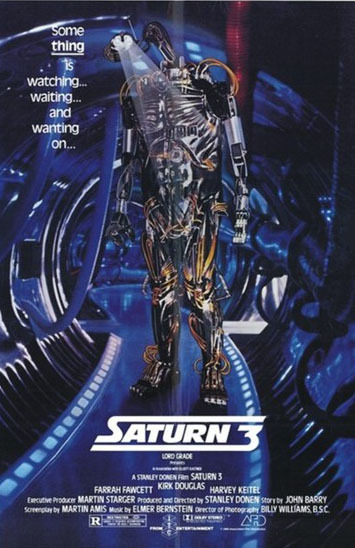 One such disaster is the 1980 science fiction thriller Saturn 3. I had the misfortune to watch this dreadful film on its first theatrical release. Shortly afterwards, I wiped all traces of it from my memory banks. Recently, however, a filmmaker called Greg Moss has brought it all flooding back. Thanks Graham for posting this. Really appreciate it! And I agree entirely – sometimes the stories behind train wrecks of movies are far more interesting than the movies themselves. Or at the very least, knowing what went wrong allows greater understanding of the final result – no matter how damaged or misshapen that result may be. I guess if the debacle of Saturn 3 has anything to say; it is that nothing has changed in the last thirty years – there are still films being rushed into production without an ideal script, recalcitrant stars forcing the removal of directors and studio execs meddling in the creative process.